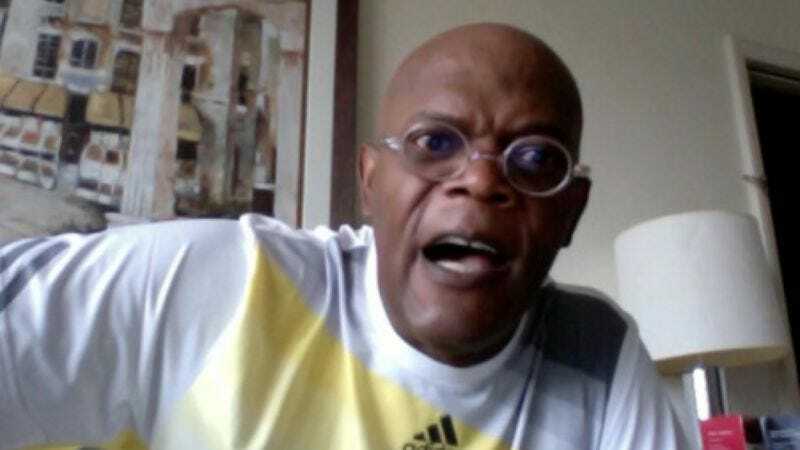 Breaking Bad has a boatload of instantly memorable lines (“…Run.”), but the one that has transcended the show to reach catchphrase status is Bryan Cranston’s “I am the one who knocks!” speech from fourth-season episode “Cornered.” Now Samuel L. Jackson has recorded an impromptu performance of the monologue via webcam, one of the rewards for a charity campaign Jackson is participating in for the Alzheimer's Association. It’s a muted performance, without the same amount of fire and bombast in Cranston’s take. But it does show just how much Cranston embodies the ruthlessness that Walter White adopts over the course of the series, and how difficult it is to imagine anyone other than him in that role. Now, if only someone could splice this together with Jackson's catchphrase from Snakes On A Plane.